Angled paring combines forward and downward motion. Bend over your work. Keep your rear elbow locked, and slightly up and back. Swing your shoulder and power the chisel with your upper body to take short, slicing cuts. Ball of support free to swing. is locked, up and back. $20 buys a basket case. This "before" photo reveals a homely appearance but not the failing joints, bowed sides, and other structural problems the authors encountered in their rescue effort. It's smart to take it apart. Piecemeal repairs often perform poorly. By disassembling the case, you create an inventory of parts that can be evaluated accurately. Some can be reused, while others will need to be repaired or replaced. _ ripple molding. None of the trim details went together, the case sides looked cupped, and the top looked suspiciously unoriginal. When you've got a sad case like this one, complete renovation is more than a one-evening project. You have to take the piece completely apart, save what you can, and replace the rest—then put it all back together again. It's still a lot less work than building a new bureau from scratch. It's also a lot of fun, because you get a close look at the work of a long-gone cabinetmaker. Start by taking a few "before" photos. They'll record noteworthy details and also serve as proof of a dramatic rescue job once you're finished. At this stage, you can begin to devise a strategy that is partly technical and partly aesthetic. The technical part of your plan should enable you to rebuild this kit of parts into a sturdy and functional cabinet. Your aesthetic concerns will make it look really nice. This two-part strategy needs to evolve as you get into the work. At every stage, the key is to be bold and thorough. The case sides were so badly cupped they seemed beyond saving, but after some exploratory sanding, we hit paydirt: mahogany veneer, probably Cuban, tight and thick. 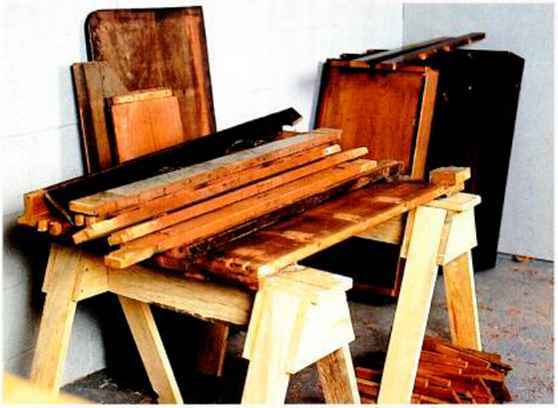 The priceless mahogany was hide-glued to a softwood ground, and although there were some cracks and broken edges to repair, there were no bubbles or voids. Instead of chemical stripping, we sanded off the old finish to reveal the rich red wood. They don't make veneer like this any more. Our bureau was built like a lot of old solid-wood furniture. The sides are connected by five front rails that define the drawer openings and two back rails that also serve as nailers for back boards. The case sides rest on the floor. Before the glue failed, the case took a lot of its stiffness from a pair of pilasters that were glue-blocked to the sides. Once the sides were apart, we could see how worn the drawer support and guide system was. New drawer supports could solve both of these problems. To make each side flexible enough for flattening, we cut a series of deep saw kerfs running top to bottom on each side's inner face. We made the kerfs two-thirds the thickness of the wood and spaced them 2 in. apart. We also sawed the banged-up case feet off the sides, leaving the wood square. Reassembling the case meant gluing and clamping the original rails to the sides. The reglued case felt strong when we took the clamps off but still needed the new drawer supports to hold the sides flat. Each support is made by screwing two pieces of hardwood together to form a T-shaped cross-section. The "T" provides a pair of flanges for screwing the support to the sides, and a runner that supports the drawer. Cross-grain movement between the sides and the supports isn't a problem—the saw kerfs take all the fight out of the old wood. Gentle persuasion. Cushioning the blow with a block of wood, Kirby taps a rail free of a side. Though the joints were well made, the hide glue had failed. Removing old glue. A sharp chisel is essential for removing hardened hide glue. Take special care with areas that will be reglued, like this half-dovetail joint. dccidcd co flatten and smooth the existing top and cover it with leather. Of all possible solutions, leather is the quickest route to achieving a rich finished surface. You can find skins at leather shops and at upholstery fabric stores, and if you shop, you can buy it for less than $5 a square foot. Once we had dccidcd to cover the top of the chest with leather, it was natural to forget about paint and cover the drawer fronts too. There's more detail about gluing leather onto wood in the sidebar on page 54. Adding cleats and edging. Kirby planes new mahogany edging flush with the rail it covers. Vertical cleats stiffen the case and provide backing behind new corner posts. Corner posts and base trim. New, larger corner posts, simple base trim, and matching rail edging give the remade piece a more contemporary appearance. 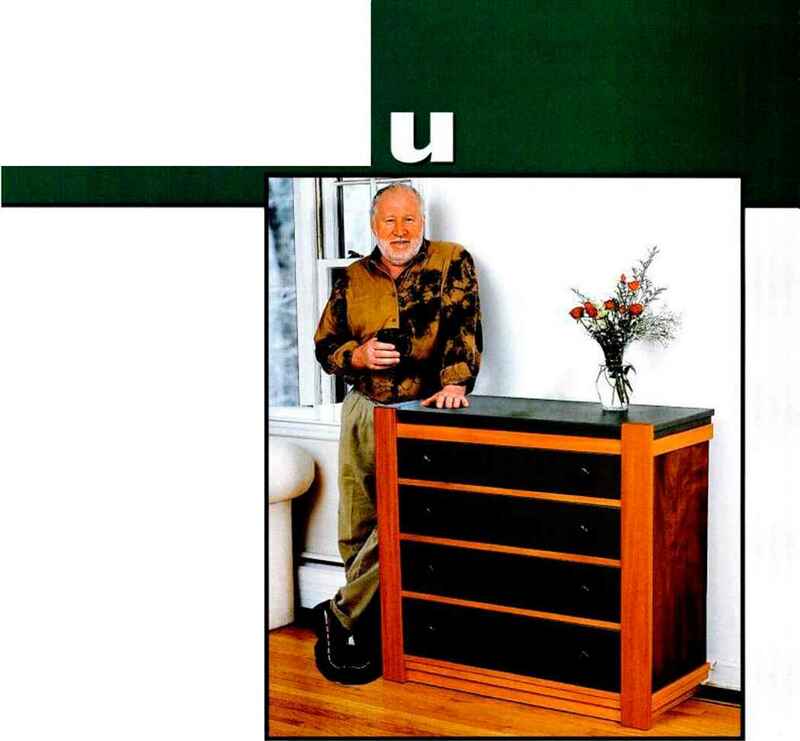 you're satisfied with the way all the drawers fit. The open back made it easy to attach side guides to the drawer runners and test each drawer for smooth closing action. At first we thought the bureau top might also be mahogany veneer, but it turned out to be a bland white wood—birch or maple—on a pine ground. It was a replacement added during the case's previous bout of repair, stained blotchy brown and not worth saving. Our drawers were falling apart, so disassembly was no problem. Earlier repair work had already added drawer slips to the worn bottom edges of the drawer sides, so we didn't have to re-do that. After cleaning the old glue out of the drawer dovetails and gluing them back together, we fit the old drawers the same way you'd fit a new drawer. We screwed new side-guides to the supports to create smooth side clearance. To fit the drawer fronts neatly in their openings, we had to plane some down, while others required the addition of a glued-on slip. Regluing sides and rails. 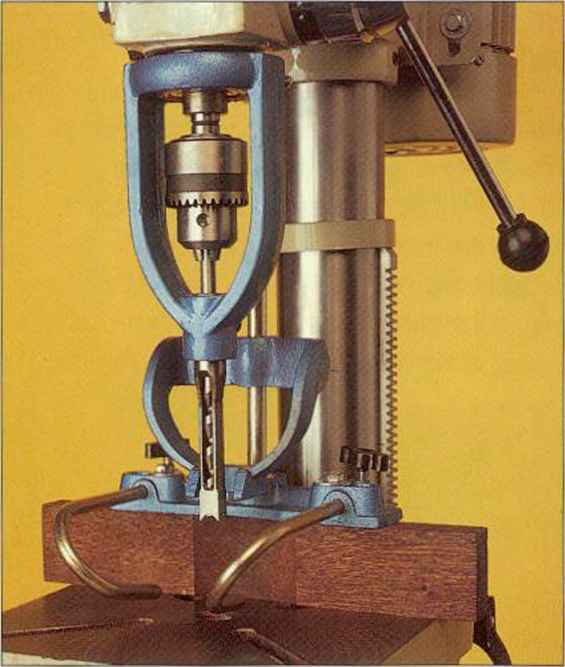 Kerfs cut on the inside face of each side provide enough flexibility for Kirby to flatten these parts during reassembly. New drawer supports. Installing the T-shaped supports pulls the sides flat. The supports are aligned with front rails and with layout marks on a measuring rod. didn't want to reuse the original trim, the visual composition of the chest seemed to need the bands of light and shadow it had cast. 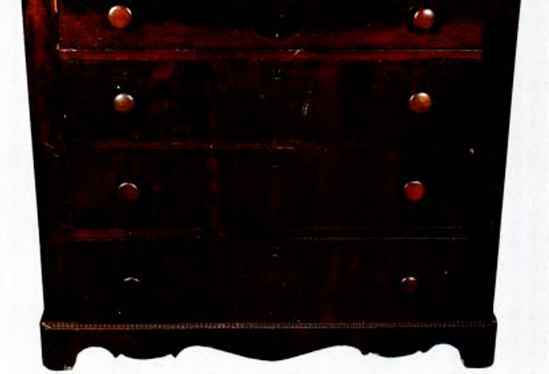 Three of the drawer rails were covcrcd with dark slips of Cuban mahogany, and one was covered with a lighter wood. Evidently the maker intended to make the mismatch disappear under stain. For us, deciding to glue leather onto the top and drawer fronts made the trim decision an easy one: We needed visible wood to tie the new posts and the old mahogany sides together. Putting the new trim where the old moldings had been preserved the original proportions of the bureau, minus the curlicues. Making the two front posts larger than the original ones cast a shadow reveal on both sides and front. This work-saving detail also allows the smaller trim pieces to simply die into the posts without complex joinery. Bringing the posts through the top avoided having to wrap the leather around an outside corner. With the drawer fronts and top covered with leather, finishing work was minimal. A coat of shellac followed by buffed wax restored the Cuban mahogany sides to their original glory. The new corner posts and front rail trim form a well-proportioned frame for the drawer fronts and top. Who could guess that this fancy bureau began as a $20 basket case?